Federal goes on to explain that their 3rd Degree turkey loads have “20 percent No. 6 FLITESTOPPER® pellets, 40 percent copper-plated No. 5 lead and 40 percent HEAVYWEIGHT” #7 pellets. Although the description of this triplex load does sound gimmicky, the underlying reasoning is sound. A problem with the ultra-tight turkey patterns at the longest possible range is that they are a handicap at close ranges. Your ideal 50 yard load may be a comparatively dinky little fist of pellets at ten or fifteen yards. Federal addresses this with the addition of the 20% Flitestopper pellets that migrate out of the pattern quickly. It works just as promised. The pellet count of the 1-3/4 oz. load is about 339: significantly better than a 1-3/4 oz. load of #5 lead which normally gives you 297 – 298 pellets. It is a good enough load that you don't need a dedicated turkey choke inside 40 yards: a Trulock Precision Hunter Improved Modified produces more pattern than needed at 40 yards and in. It is still a bit difficult to kill a turkey much past dead. If you want to go out further, you can certainly use a tighter choke, but for spring turkey hunting, I've never needed anything past 40 yards, and a typical shot is closer than that. 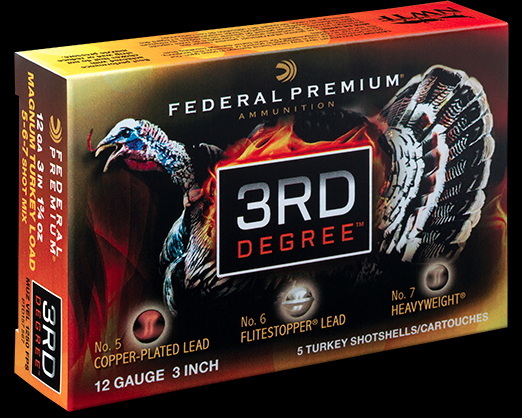 Federal 3rd Degree is also available in 20 gauge 3 inch unfolded length shells with a heavy (for a 20 gauge) 1-3/8 oz. payload. Federal has put in a lot of R&D on these loads, and it shows. The goal was the most versatile, generally effective shell at multiple ranges and I'd say that Federal has achieved their objectives with 3rd Degree.